Are you having a really, really bad day? 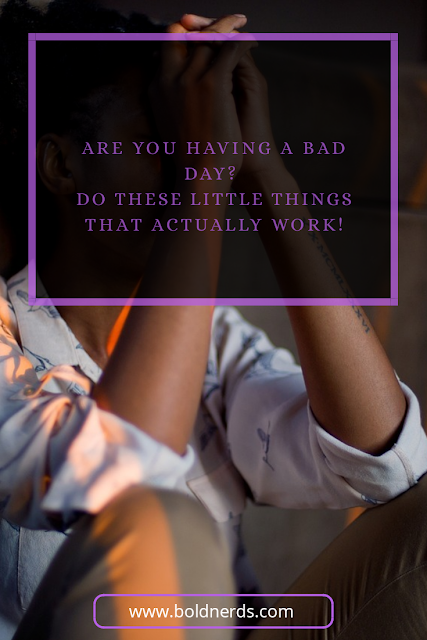 Here are proven tips that work to ensure you get back on track even when it's your worst ever day. Are you having a terrible day or a bad day? The worst you can do when having a bad day is to do nothing. We all have bad days sometimes and when this happen, your way of handling it determines how fast you're going to bounce back. 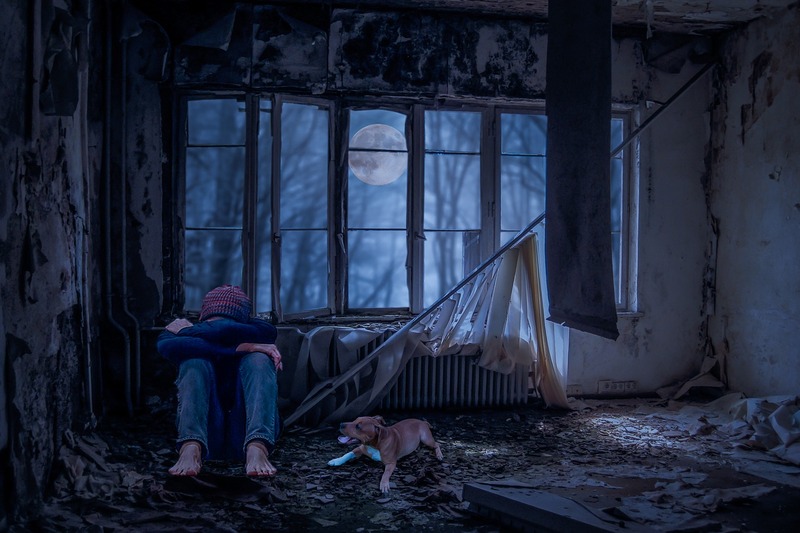 Life is not always smooth, sometimes it gets so tough and rough and even makes it difficult for you to get back on track but, you have to stay strong and find ways to recover faster. You can do a couple of things to pick yourself up after a bad day. 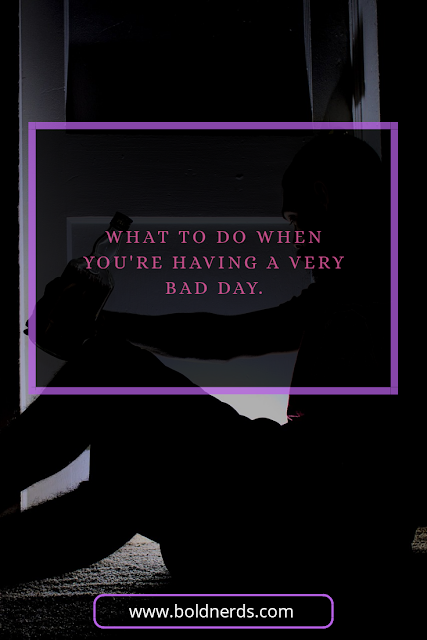 What to Do When Having a Bad Day? There are so many things you can do to recover from a bad day. Here, I have outline 10 different ways you can bounce back after a bad day. Yeah, it isn't easy as it may seem but you have to make an effort. Don't let bad days get the better of you. Here are 10 things to do when having a really bad day. One thing I won’t recommend is to stay indoor when you’re having a bad day or probably depressed and finding it difficult to keep the balance in your mind. Go out there and find something amazing to do. It doesn’t matter if there isn’t so much fun to catch outside, you can ride a bicycle or visit a close friend to spend some quality time. If you happen to live close to a recreational facility, that’s also a good place to go. Aside this, you can go for a walk and stare at nature’s gifts. It’s a healthy thing to do. When having a bad day, who do you talk to? This is very important. There are people who will be helpful talking to and others who’ll just make things worse or give you a terrible advice. If you have a best friend who you trust and has proved himself/herself to be someone who gives very good advice, you can rely on them. You can also speak to your mum, a spiritual leader (pastor) or even your pet. You can only move away from a situation when you have a reason why you should move on. Lessons are important in everything we do. What life throws at you shouldn’t break you but make you. All you have to do is to pick out some great lessons from the situation. Meditation is the practice of becoming more aware of your thoughts. Although many perceive meditation as sitting, crossing your legs while you go deep in thought, it’s actual more than how you see it to be. You can meditate anywhere and at any time. This practice helps you control stress and also help you understand the situation better and moreover helps clear off your mind of all negative thoughts. We all know how regular exercise can boost your mood and improve your mental health. You don’t have to go to the gym. You can workout at home or go for a walk. This will help you regulate your mood. Before you let yourself drown in sadness, ask yourself some very important questions. Is this really bad as you think it is? Are your emotions getting the better of you? Answering these questions will help you to be more realistic about the situation and enlighten you on how to tackle the problem. Music they say heals the heart and soul. It has the power to help us forget about our problems. Get your favourite playlist and sit quietly. Let the music take control of your inner self and heal you. if you’re depressed, make sure you avoid sad and emotional songs as they can only get you more depressed. Great movies can switch your mood in a single minute. Get yourself some nice and funny list of movies and laugh out loud while you watch them sipping on your smoothie or ginger tea. You must definitely have some good memories you have well-captured somewhere in a photo album or phone gallery on a recent trip or a birthday party. Take a scroll through them and unleash all the negative thoughts and frustrations of the day. Life doesn’t get easier, challenges will come while you still live but you have to stay strong. Some days are really tough but you’re going to be fine. Just have a little hope and look at things in a positive way. It happened for a reason and it happened to you because you can handle it. Believe this will make you stronger and when you see things this way, bad days don’t really get the best of you. Have you had one of those days? A day when nothing seem to be going well or perhaps a day you were humiliated publicly by a friend or your boss. You're not alone! 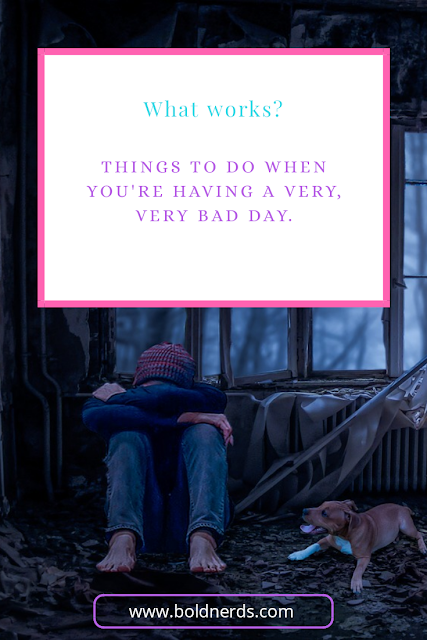 These tips worked for me whenever I'm down and having a really, really bad day. They'll work for you as well.